Dorinini Dvori is situated in Svetvincenat, Istria. Our holiday rental property sleeps up to 4 people. Dorinini Dvori has has 2 air conditioned bedrooms. The Villa can sleep up to 4 people. 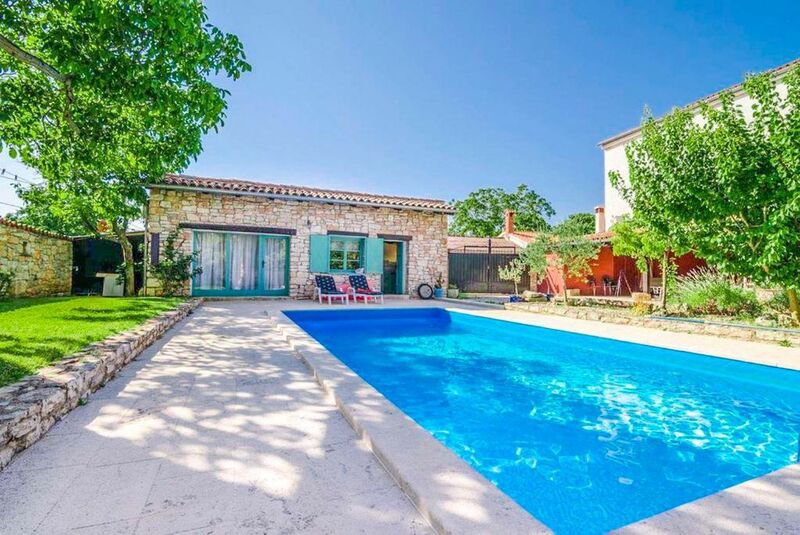 The property is located in Svetvincenat is a Venetian Village, dating from the 1400s which grew around a 'Benedictine' Abbey and Castle. There are several interesting churches, including the Church of Saint Catherine. There are 5 restaurants which all receive very high Trip Advisor ratings. There are delightful walks around the village. This was such a unique southern villa with lots of charms. I love the countryside, was such a nice peaceful feeling of leaving my hectic city life far behind, even if it was temporary. I will be visiting next year again. Was the most wonderful and enjoyable stay, just what was needed to help my husband recover after an operation. We had a relaxing and very enjoyable holiday at Dorinini Dvori which is a charming property enclosed in a beautiful garden. The owner is helpful and available if needed but does not intrude on the visitors privacy. The property and environment is most suited to those who prefer quietness, nature and the countryside. Idyllic! We wanted a property where we could go with friends and still have privacy. This was the perfect solution: 2 lovely stone cottages surrounding a private pool. We could not have chosen better. The village is centrally located, so it was perfectly suited to exploring Istria. Day trips out and evenings in by the poolside BBQ! (Friendly property manager helped us when we needed to light the BBQ which was well stocked with wood!) Memorable vacation and one we hope to repeat.